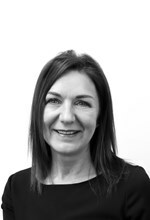 Kathryn is Director of HR, Training & Development and Internal Recruitment at Search. Based from our Glasgow office with a UK-wide responsibility, she has worked with Search since 1996. Kathryn’s HR team is responsible for providing a generalist HR service to the business, which covers Employee Engagement, Employee Relations, Employee Policies & Procedures, Salary & Benefits, Employment Law and Onboarding. In addition to our permanent workforce, the team also has responsibility for managing our temporary and associate workforce. The Internal Recruitment team based in Leeds, in conjunction with divisional managers, are responsible for sourcing and recruiting exceptional talent for Search across all our industry divisions within our 15 UK locations. Our Training & Development team supports the business by providing first class training to both new and existing employees, ensuring their continuous development and demonstrating Search's commitment to individual and company growth. Kathryn is a specialist in Employment Legislation. She has a Diploma in Personnel Management and is a Fellow of the CIPD and a Fellow of the Institute of Recruitment Professionals. Her HR experience covers a range of industries including Recruitment, Gaming, Retail and Hospitality. Together with her team, she has overseen Search becoming the first recruitment company to achieve Investors in People Platinum status.